Ponta dos Ganchos is an awarded resort on the coast of south Brazil. In early 2016, they started a rebranding strategy partnered with Dzigual Golinelli, which would include an all-new visual identity and a website. I was the responsible for the new information architecture and my goal was to bring the custom-tailored experience and feel that Ponta dos Ganchos offers within its diversity of features and activities. The current website was simply outdated and packed with unorganised content while also lacking important information, which led to a high volume of client contact in their back office. Couples with a desire for high-end vacations with little contact with other guests in an exclusive bungalow. Their interaction with the resort in social media is very small, and the website is mostly used to check pictures, since the reservation process is made through an external page. In short, to get to know the hotel these users wanted to know about accommodations and facilities through photography that conveyed the look and feel of being there. We had almost 50 diverse items between activities, facilities and services offered by the resort and no previous categorization. In fact, many of them were never explored in any communication, because they didn't fit anywhere before. We've decided everything offered to the guests was part of the their unique experience. Sitting down with the Marketing team, we’ve set up an open card sorting method in which we’ve discovered 6 experience categories the guests of Ponta dos Ganchos could explore based on previously analyzed guest profiles and preferences. The gallery's challenge was to keep it as a main feature while offering simpler access to lots of new internal pages. So, we've came up with an integrated gallery system. 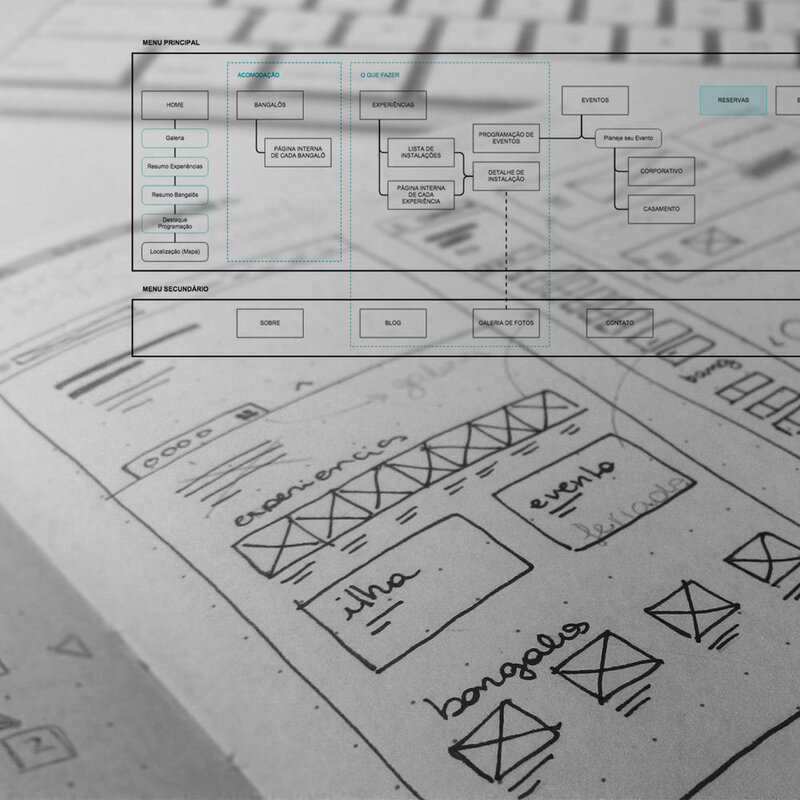 Not only it would keep the pictures as the main focus, but it would provide an alternative navigation flow. 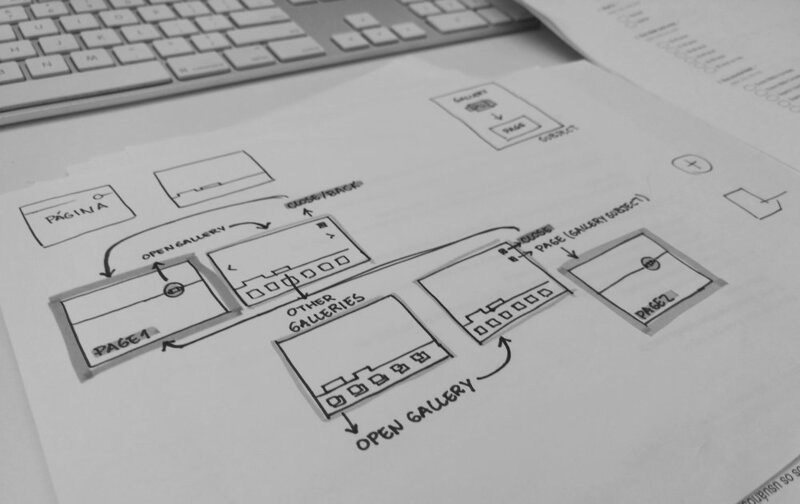 Many flows were sketched until the team was happy with the results. Then we've moved on to high-fidelity prototypes and guerrilla testing for validation. These services were sometimes unknown to us, or their particularities were difficult to guess by their titles. 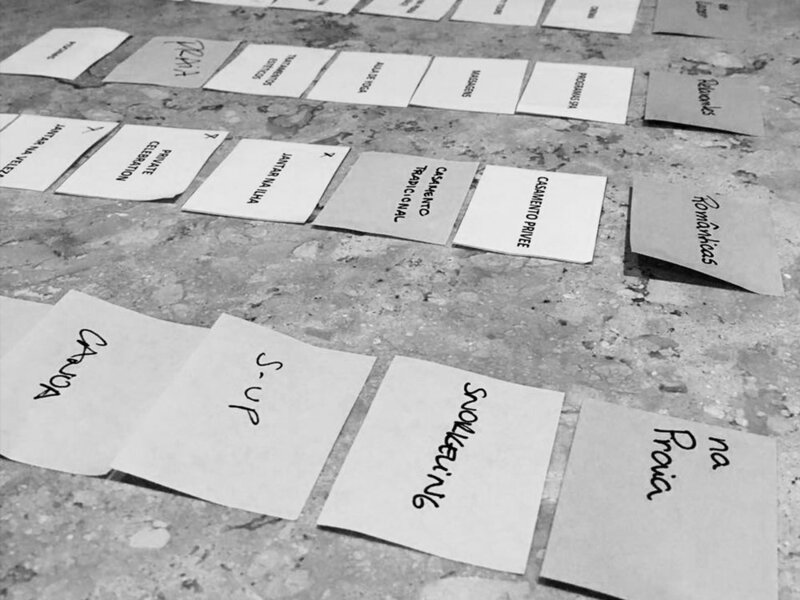 A card sorting with stakeholders made us quickly learn the differences between services, analyse labels (and suggest different ones), and build together a structure that contributed to their business plan. Quick testing the gallery navigation brought to us users difficulties we wouldn't have guessed. It was a small, complementary feature and we couldn't justify the time to test it formally, but we were endeared by it and determined to make it work. 4 simple tasks were sufficient to iterate this interaction into a better version of itself.